With more and more Anti Gun Politicians pushing for Red Flag laws, assault weapons bans, gun control legislation. We feel that it may be important to highlight the cases that show that gun control does not work. With most active shooter incidents taking place in gun free zones, law abiding gun owners are stripped of their right to defend themselves or their loved ones and are left vulnerable to the criminal element. You know, the guys who despite strict gun laws are still running around with their weapons that they DO NOT turn in. They DO NOT register. More information has come out that 5 people were shot execution style inside the bank. WSBT-TV had reported that the shooter “for some reason always hated people and wanted everybody to die,” Alex Gerlach told WSBT-TV, shortly after Wednesday’s shooting. “He got kicked out of school for having a dream that he killed everybody in his class, and he’s been threatening this for so long, and he’s been having dreams about it and everything. Despite the warning signs, Red Flag Laws and waiting periods did nothing to stop this senseless act of violence. 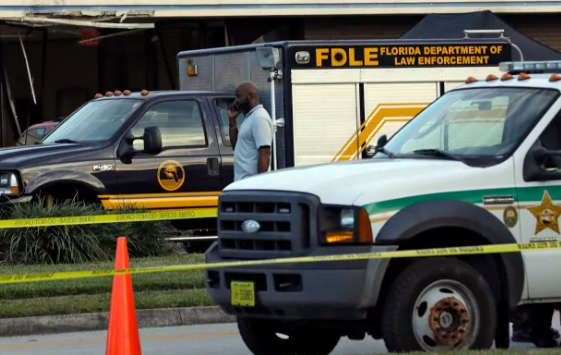 Breitbart writes Florida’s red flag law and waiting period for gun purchases failed to stop the horrendous massacre at SunTrust Bank in Sebring, Florida, on Wednesday. Breitbart News reported that Gov. Rick Scott (R-FL) signed a $400 million gun control package just weeks after the February 14, 2018, Parkland high school shooting. That package included a red flag law, empowering judges to issue firearm confiscation orders for persons believed to be a danger to themselves or others. CBS News reports that the gun control package also applied waiting periods to long gun purchases. Prior to the Parkland attack waiting periods only applied to handgun purchases in Florida. There it is again. Another example that GUN CONTROL DOES NOT WORK! Criminals will always find a way to rob, kill, assault whether they can get a gun or not and as mentioned in an earlier article, they will buy their guns off the streets or steal them. This statement is backed by a study done by the D.O.J. Again, we are going to hammer this one. Many anti gun politicians are pushing for gun control to take away the responsible gun owners right to self defense. They laws will only enable the criminals who do not turn in their weapons leaving law abiding gun owners vulnerable. It is up to responsible gun owners to register to vote and get out and vote. If you want to see a bill defeated you need to go vote. If you do not vote you are only allowing the anti gun crowd to push unconstitutional laws. They are voting and so should you. We need to push back. Don’t just sit there sharing on Facebook. contact your representatives. Call, write, we don’t care, but make sure your voice is heard!